WordPress.com Apps - Big Update: WordPress for iOS 2.8 Available Today! Big Update: WordPress for iOS 2.8 Available Today! It’s been in the works for about two months, and we hope you agree with us that it was worth the wait. This is the first app version in a long time where we’re actually adding features, previously we’ve been 100% focused on improving stability, error messages, and help. While these efforts will continue indefinitely, we now feel like the app is stable enough to start adding some long-awaited features. The Quick Photo button, lets you snap a picture of something happening right now and blog about it quickly. We’ve added Stats to the app (finally!). The app has also been translated to 10 languages, including Spanish, French, Portuguese, and Japanese. The “Quick Photo” button is a big step towards the next-generation WordPress app. It’s the first feature that’s action-centric, meaning that instead of picking the blog, and then selecting what you want to do with it, you pick your action first. The thinking is that an app should be all about getting in and out quickly, performing a specific task. As you launch the app, you’ll notice there’s now a button in the bottom of your blogs list. Tap it to launch the camera and take a picture, when you’re satisfied you can add a title or a description (if you want, both are optional), and boom — you’re done! The function remembers the last blog you posted a Quick Photo to and will use that for future posts as well. Note: iPhone only for now. Finally you’re able to check your blog’s statistics on the go. 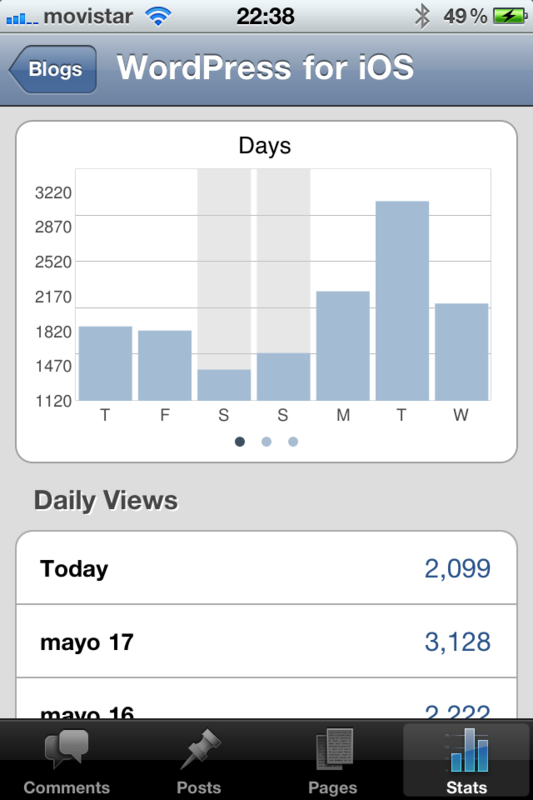 There are charts for Daily, Weekly, and Monthly page views, swipe over them to see the others. You can also see Daily Views by date, as well as top Post Views, Referrers, Search Terms, and Clicks for the past 7 days. The Stats feature natively works for all WordPress.com blogs, however you’ll need Jetpack or the stand-alone Stats plugin to see stats for your self-hosted WordPress blog. We recommend that you enable Jetpack on your site, as we’ll add app-specific functions to it in the future to help further enhance the apps in a quicker turnaround time. This has been long awaited for a lot of you. We’re happy to report that the WordPress for iOS app is now completely translatable, and 2.8 adds support for 10 languages: Japanese, Italian, Portuguese, Spanish, Swedish, Hebrew, German, Dutch, French, and Croatian. Is your language not translated yet? You can very easily add it yourself, and we’ll put it in the app in a future release! 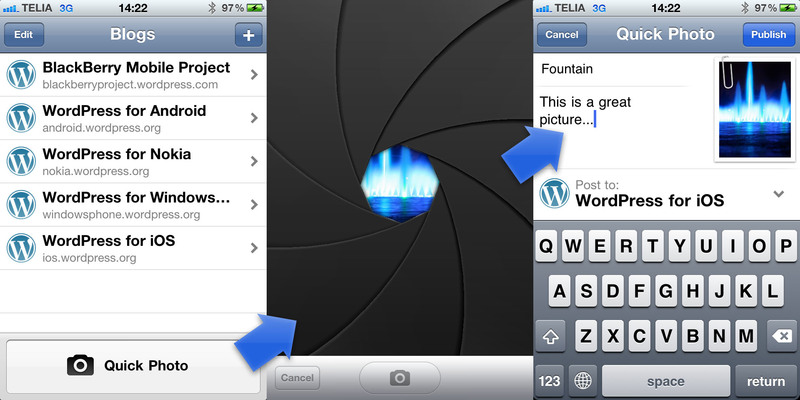 To get started, visit the WordPress for iOS project on translate.wordpress.org (learn more). You don’t have to translate all strings, other people will join in to translate remaining strings. While we’re excited about adding a few new, much requested features, we know that stability is still an issue. We’ve been able to resolve 3/4 of all crashes in the app. This update fixes a number of additional crashes and bugs. The full list of crash and bug fixes is available in the WordPress for iOS Trac. Be sure to follow @WordPressiOS on Twitter for the latest news.